We are a full-service millwright firm dedicated to helping you pick up machinery, transport it to the job site and install it. We have an in-house metal fabrication shop and a Robotics Division to provide robotic solutions for manufacturing, production, warehousing and other industrial applications. 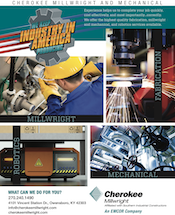 At Cherokee Millwright, it’s not what can we do – it’s what can’t we do. Learn more. Dave Bennett, president of Cherokee Millwright, is just one of the many people that deliver projects that meet our clients most exacting standards. Robotic solutions are one of the fastest ways to bring automation and seamless integration and efficiency to any industrial application. Learn how we provide turnkey solutions that includes installation, programming, mapping, maintenance, and support.